Clara Bow was an actress in the 1920's during the silent film era. 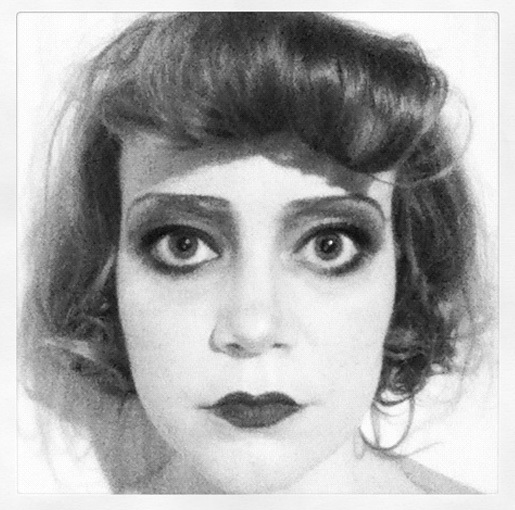 I don't normally go back as far as the 20's when it comes to hair and makeup, but I thought I would push myself a little bit. This tutorial is an example of how sometimes things don't turn out as planned, but you just improvise because there is no right or wrong way to do a look. I wanted to do a finger wave for this hair style and I knew that my hair was too long, but I thought I would try it and see how it turned out. 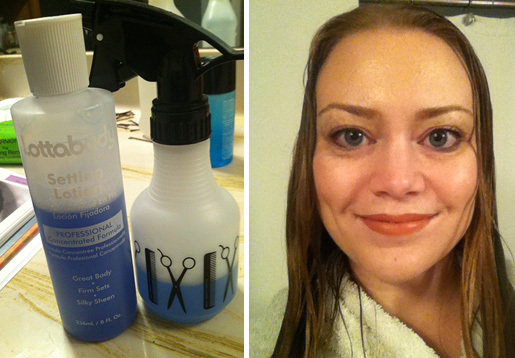 First I saturated my hair with a setting lotion called Lottabody. You have to dilute it with water and use a spray bottle to apply it. I used finger wave clips to help the style hold. These aren't necessary, just an aid. I bought these at Sally Beauty Supply. I also made pin curls, one at my temple and two on each side above my ears. Using a comb I swept the hair back and across. I then pressed my index finger down and pushed the comb up to create a ridge. I then put the clip on the ridge to hold it. I then used the comb to sweep the hair in the opposite direction to create a "C" shape and continued to apply clips as I went. 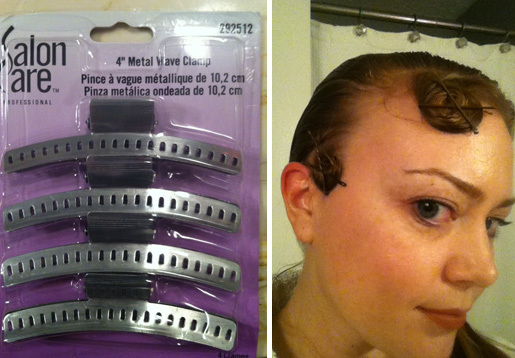 Views of the placement of the finger wave clips. 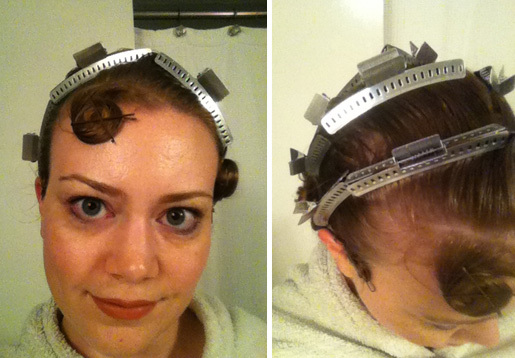 After the hair was done I sat under my portable, vintage hair dryer that I've used in other tutorials. I then moved on to the makeup. The eyebrows are the most distinct characteristic of this look. In the 20's the eyebrows were over plucked and a thin line was drawn. 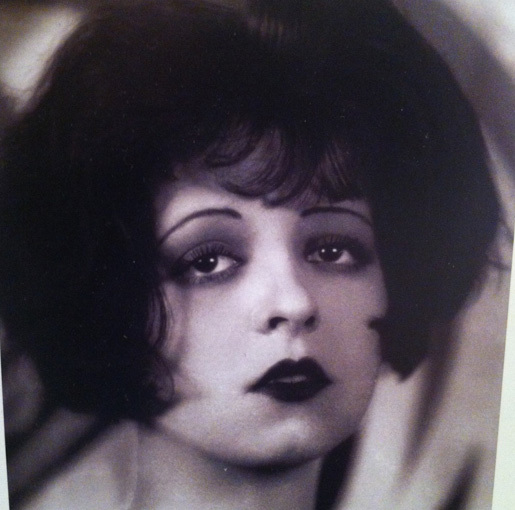 Clara Bow's eyebrows curve down on the ends and create a look of permanent sadness. To cover my brows, I used Ben Nye nose and scar wax. I had this left over from Halloween. It's a sticky, skin colored substance used with prosthetic applications. It's hard to work with because it's so sticky and almost melts with the heat of your fingertips. 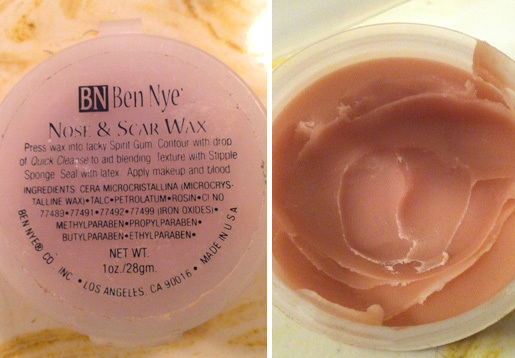 Ben Nye nose and scar wax. I scooped out a little bit and rolled it between my hands to create a snake shape. 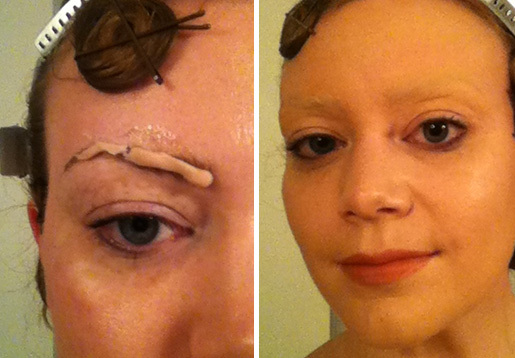 I then flattened it a bit and spread it across my brows. This is not an easy task and can become a big mess quickly. Make sure and powder the brows well to set the wax. Another issue with the wax is that as you wear it and as you apply makeup to it, it becomes more visible that you have covered your eyebrows. It's difficult to keep it seamless. The next step was to draw on the eyebrows. I used an eyeliner brush and a black eyeshadow. 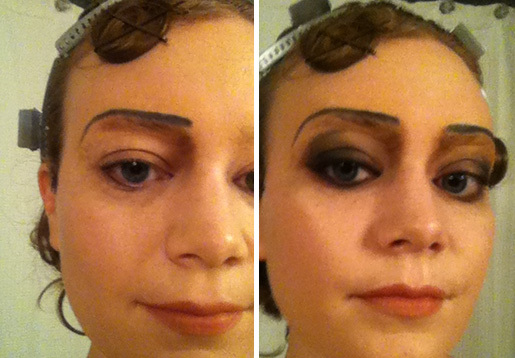 I then took a brown eyeshadow and contoured the inner corner of the eye and underneath the eye. Clara Bow had very dark eyelids and dark lips. I then used a black shadow to create a smokey effect on the outer corners of the eyes. I also used the same brush and shadow to line the eyes and smudged it underneath the eyes. I finally added mascara and used a light brown shadow to contour the bridge of my nose. Clara had a bit of a round tip on the end of her nose. I added just a bit of blush and blocked out my lips so I could create the signature lip shape. Clara Bow was just as known for her lips as she was for your eyebrows. Because it was a black and white time period, I used a black shadow to draw inside my natural lips shape. This was a distinct look of this time period. 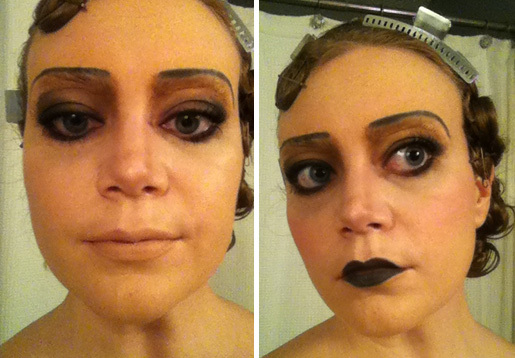 Left: Contoured nose and blocked out lips Right: Black under drawn lips. So, as I said, you can tell that the more makeup I apply and the longer I wear it, the more obvious the eyebrows become. Also, after I took my hair down, I did not like the wave effect that I achieved, so I decided to go with a much softer, bobbed look. I rolled my hair under and pinned it to make it look shorter. I also rolled my bangs under to give the illusion that I actually have bangs. It may not be the look I had originally envisioned, but I think the inspiration still comes through and I'm pretty happy with how it turned out. I want to emphasize this those who try recreating these or other makeup tutorials to help them understand that no two looks are alike and they don't always turn out how you thought, but it's all about being creative and having fun, so make it your own.